Looking for a cheap car hire in Lithuania? We will compare the rent a car market for you to get you the cheapest price and above all the best offer. Car Hire in Vilnius airport VNO and Vilnius railway station, Kaunas airport and Palanga Airport, Druskininkai. We will get you the best offer for car hire in Lithuania with GPS Navigation and with no excess and fair fuel policy. One way and cross border car rentals available. Lithuania is the most southern of the three Baltic countries, Lithuania is 3 million strong country bordering Russia, Poland and Latvia. Its culture and language are unique on the European continent, being a combination between Slavic and Northern influences. Being quite small and lacking an extensive rail network, the best way to travel around is by car. The easiest way to arrive in Lithuania is by plane, in Vilnius, the capital of the country. In the airport, you’ll find lots of car rental desks, offering vehicles at reasonable prices (you won’t need anything bigger than a Golf, as the roads are quite good and traffic is not that dense). You can rent a car in all major cities at Vilnius airport VNO and Vilnius railway station, Kaunas airport and Palanga Airport, Druskininkai. 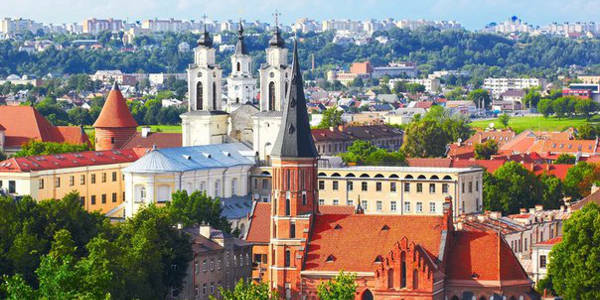 Within a half an hour drive from the airport, you’ll find yourself in the center of Vilnius city. The city is small by European standards (half a million inhabitants) and lacks the annoying traffic in other European metropolis. Despite its small size, Vilnius is astonishing: the center has not been affected at all by the 60 years of Communist rule, being blessed with lots of classical architecture and large pedestrian areas. The Gate of Dawn, a part of the Vilnius fortifications is the symbol of the city, having strong religious and cultural significance. Churches from the middle Ages and Orthodox Cathedrals are spread all over, proof to the strong religious background of the Lithuanian people. The Vilnius TV Tower, as well as the Castle, provide excellent views over the city and surrounding areas (very green, actually). 20 km North of Vilnius, you’ll find the Geographical Center of Europe, the point where, after many calculations, some scientists (because not everyone agrees with them) decided that distance between north and south and west and east is equal. A good place for a photo and a nice story for your friends. The whole Southern part of the country is full of national parks, including Dzukijos and Zuvinto. You can visit them by taking slight detours off the road between Vilnius and Mariajmpole. Lithuania’s national symbol (present even on the country’s Euro coins), the Trakai Castle is just a short one hour drive South of Vilnius. 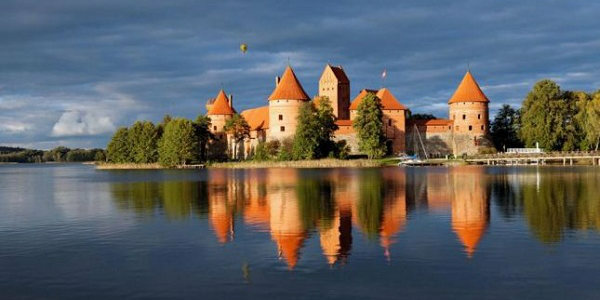 The castle was built on an island, in the middle of Trakai Lake, in the 15th century, by national hero Vytautas the Great. Now it is accessible using a wooden bridge, after many centuries when you could get there only by boat. All the way east, on the banks of the Baltic Sea, we find the port city of Klaipeda, one of the most oldest members of the world’s first commercial trade union, the Hanseatic League. The motorway between Vilnius and Klaipeda will take you there in about two hours. While the port is nothing special, there are some beautiful landmarks spread around the Lithuanian coast: the Nida sand dunes overlooking the Baltic Sea, the Palanga beach resort (you won’t do much sunbathing at the Baltic, that’s for sure) and, last but not least, the Curonian Split (the patch of land between the Curonian lagoon and the Baltic Sea), which is basically a sea of sand, similar to the one in the Sahara Desert, just that colder. Enjoy your time in Lithuania! We will source the best prices and best cars for you.